Mistress Eleanor is a lady-in-waiting to Her Grace, Duchess Anna Ophelia Holloway Tarragon. Her husband and champion is Baron Duncan Kerr, and their children are Eryn fitzPatrick and Zachary Kerr. Together they head the household Equus Celox. 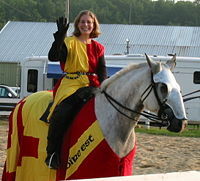 Mistress Eleanor is heavily involved in the equestrian activities in the East Kingdom. She is currently a marshal at large and has served as both a regional marshal and as the Kingdom Marshal of Horse in the past. She and her husband co-own the horses Dakota Tesoro, Medallion, Brandy and Cody. She is also the last owner of the late Leaps and Bounds. Her other interests include sewing garb, making horse equipment, painting tents, and helping out where ever she is needed. Please note that she is not overly fond of being surprised by summons to Royal Court, as her responsibilities often preclude her attendance unless arranged in advance. Eleanor lives in England during the time of the Hundred Years War.